A programme of animation that explores the fun and the fouls of human experience and our evolving relationship with technology. The Cycle is a curious little film. 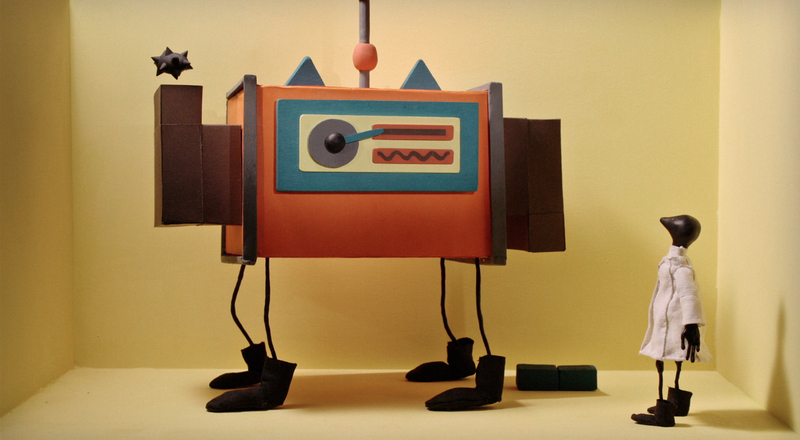 Through charming stop-motion animation it tells a simplistic story of small people/creatures and their machines living within a silhouetted person. What’s disarming about its presentation though is that as quirky and fanciful as it starts out, that ‘cuteness’ intelligently displaces us so that we are caught off guard when the narrative gradually becomes somewhat darker as the film progresses. The strength of this short isn’t in its presentation, as well done as it is. Nor does it lie in introducing a revolutionary new idea. It’s purpose derives from how it is open-ended enough to invite many readings, without seeming simply vague or kooky for the sake of it. It’s a hard job to pull off but it delivers enough visual clues to start the ball rolling on themes of health, medicine and our increasing reliance upon machinery so that it doesn’t feel too open ended, but it doesn’t wind up imposing too much and dictating a hard and fast interpretation either. This is a really strong place to start as I take a look over some of the festivals programmed films. It’s really quite beautifully animated and it does everything you can want from a short film. It’s instantly engaging, it doesn’t try to tell an epic in five minutes and it will leave you turning over the images and ideas in your mind for sometime after the credits have rolled. Stay tuned for more reviews in the lead up to The Shortest Nights!